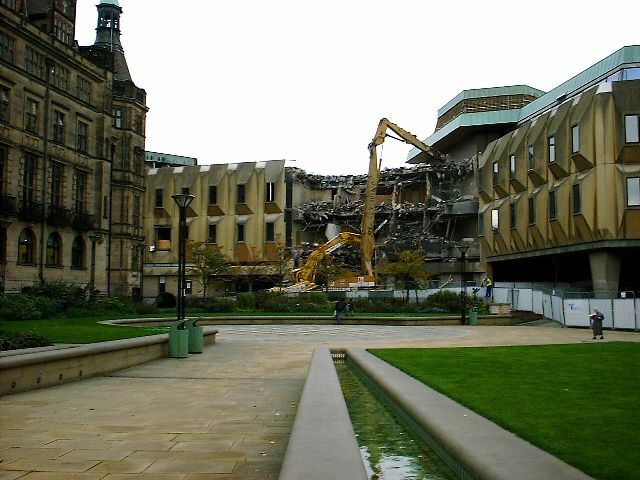 Sheffield Town Hall is a building in the City of Sheffield, England. The building is used by the City Council, and also contains a publicly displayed collection of silverware. 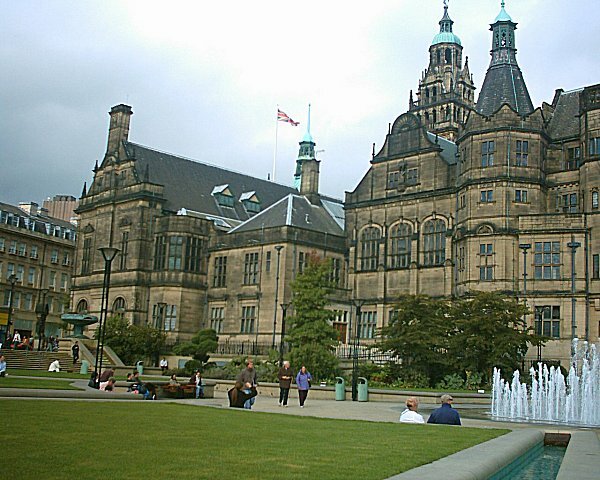 The current building, Sheffield's fourth town hall, is located on Pinstone Street. 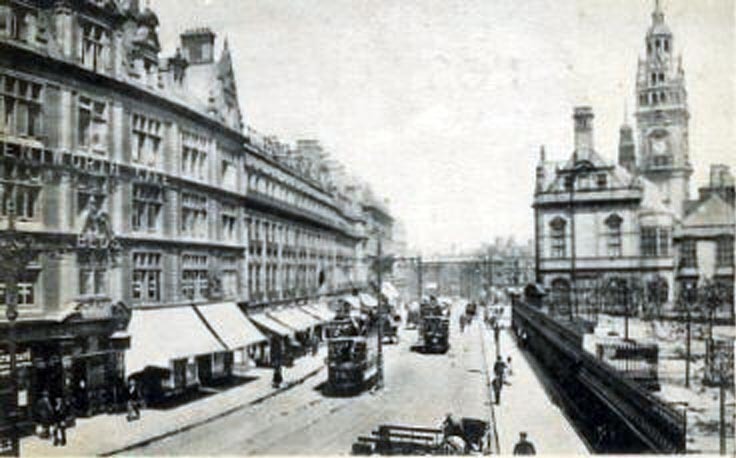 It was designed by the London-based architect E. W. Mountford and constructed over a seven year period from 1890 to 1897, opening on 21 May 1897. An extension designed by F. E. P. Edwards was completed in 1923. The design echoed to a certain extent the architecture of the adjacent St. Paul's Church of 1720 (now demolished). The exterior is built of "Stoke" stone from the Stoke Hall Quarry in Grindleford, Derbyshire and is decorated with carvings by F. W. Pomeroy. 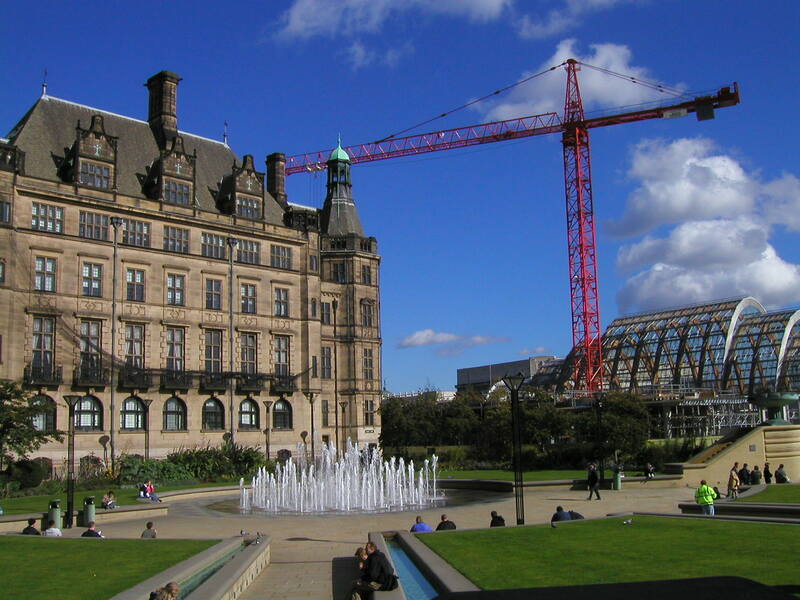 The friezes depict the industries of Sheffield, and the 64 metre high clock-tower is surmounted by a statue of Vulcan. During construction, the building was criticised for its expensive embellishments. The building was opened by Queen Victoria, using a remote control lock from her carriage. The turning of the key in the lock triggered a light in the building which was the signal for three concealed men to open the gates. 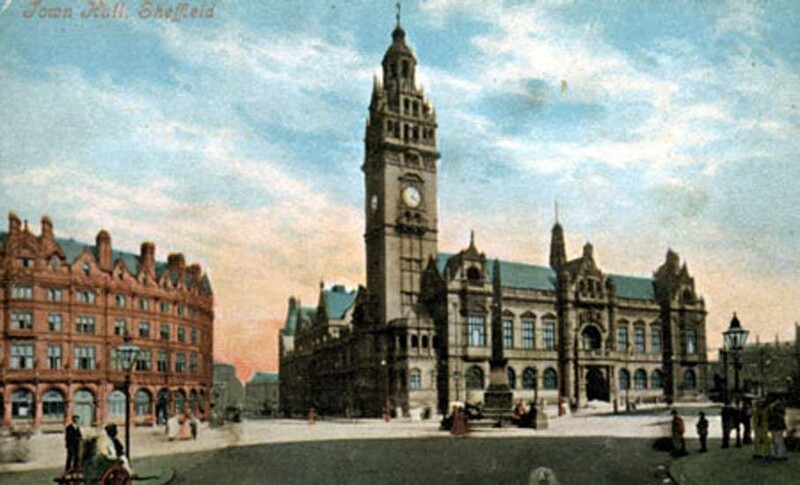 Sheffield's first town hall was referred to in a 1637 survey of the area. It is thought to have been at 10 Pinfold Street. From 1700–1808 there was a small brick-built community hall in the corner of the Churchyard. 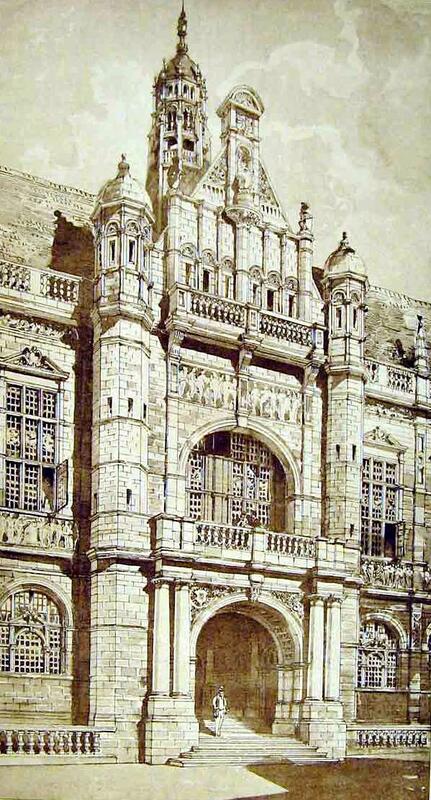 It was owned by the Town Trustees, as was its replacement, now Sheffield Old Town Hall. 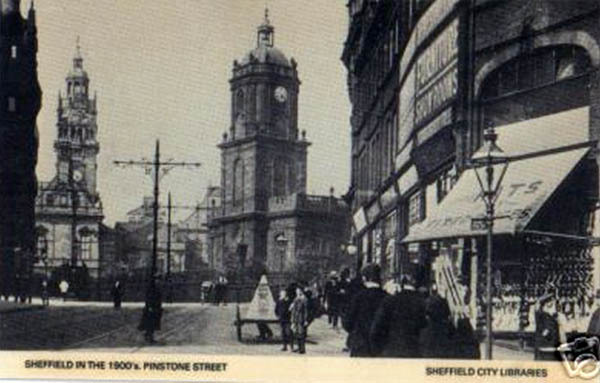 In 1886 the council cleared a number of premises in the Pinstone Street area to make way for the current Town Hall, and the old building was converted for use as a court, with further additions by Flockton, Gibbs & Flockton in 1896–7. 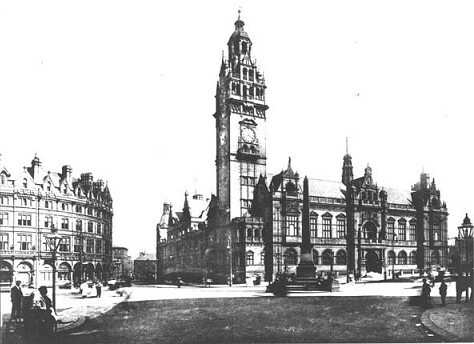 A new extension to the Town Hall was planned in the late 1930s and necessitated the demolition of the adjacent St Paul's Church in 1938. The extension plans were subsequently put on hold due to the Second World War, and the site was made into a public garden instead. The garden was called St Paul's Garden but was more popularly known as the Peace Gardens. One feature of the Peace Gardens was a standard ruler, 100 feet long, built of metal and running along what was St Paul's Parade. It was accurately horizontal and varied in height above the pavement from a few inches to about four feet. It was possible for a small child to run along the ruler, as it was about a foot wide. It was presented to the City by the Lord Mayor in 1910, partly as a Standard of Length, and partly for its public education value. The ruler showed pre-metric measurements such as chains, links and rods. By the 1990s, the gardens had got a bad reputation as a haven for drunkards. 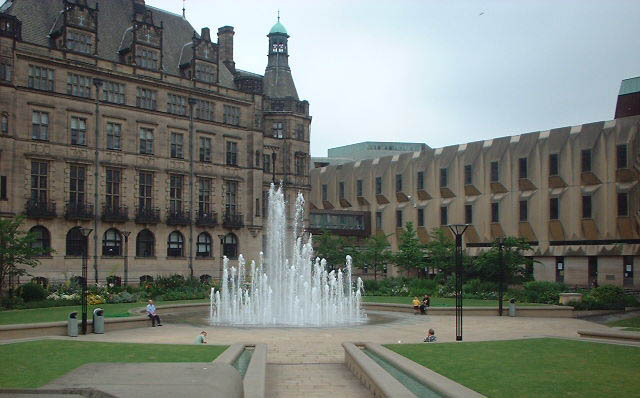 In 1998 the gardens were renovated as the first stage of the Sheffield Council's Heart of the City project. 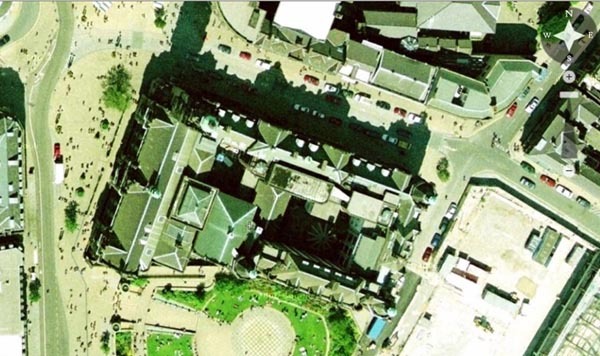 The plans faced substantial local opposition as the Peace Gardens were a popular and well-loved feature of the city centre at the time. The new layout with its emphasis on water-features was initially criticised for its lack of garden, but has since become a popular venue for families during the summer; its walk-in fountain is especially popular with children. 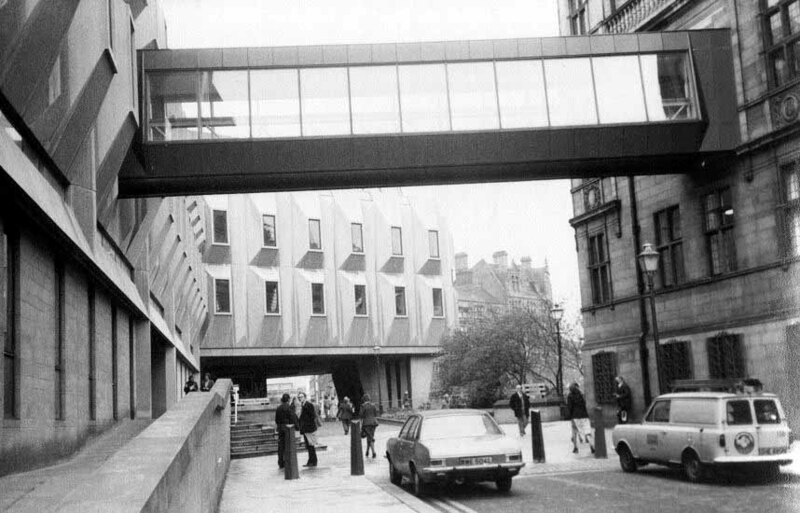 In 1977, a new council building in a modern style was added to the east of the Peace Gardens, and was connected to the old Town Hall by way of a glazed flyover. The building was immediately unpopular and was nicknamed The Egg-Box after its appearance. 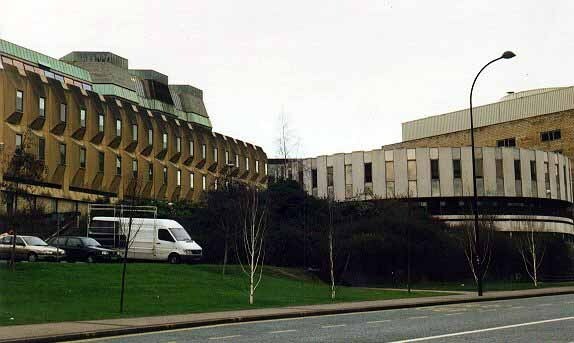 The new building, complete with roof-garden, cost in the region of £9 million and was built with a life-span of about 500 years following concerns about the tenacity of the concrete structures built in the previous decade. 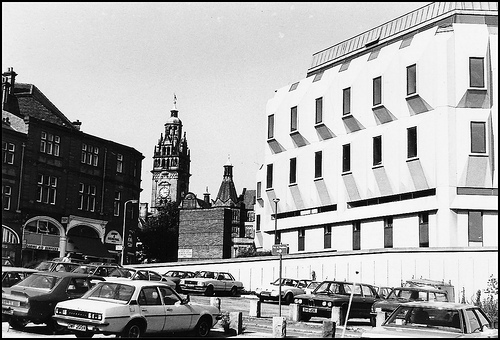 It was demolished in 2002 to make way for the Sheffield Winter Gardens, MacDonald's Hotel and an office block, and replaced with a new office block called Howden House to the south of the site on Charles Street. The first "Sheffield Towne Halle" referred to in "Survey of the Manor of Sheffield 1637" was said to have had eleven shops beneath it. Tenants included a "William Skirgell" believed to have been a carpenter. The "Widdow Eyre" and "Widdow Elmore"
The whereabouts of this building was not recorded, however a book written by R.E. Leader contained a passage that stated "No 10 Pinfold Street was thought to be the first Town Hall. Apparently it had chains attached to the walls which were said to have been used to detain prisoners. This Town Hall was built in 1700 and was a small brick building erected at the south east corner of the churchyard. It was facing High Street and there were steps leading up to the door where parliamentary candidates made their speeches during the elections. Beneath the hall were three dark damp dismal dirty prison cells. The hall was used for dances, plays and meetings during its lifetime. It was demolished in 1808. Town Hall No 3 was rebuilt a short ¼ mile away and had its foundation stone laid June23rd 1808. The architect was Charles Watson. The building was enlarged in 1833 and again in 1867 and was used as a prison with prison offices for Petty and Quarter Sessions and for town meetings. The Town Trustees originally owned the building but the lease was taken over by Sheffield Council in 1866. In 1867 the hall was enlarged and re-modelled internally. 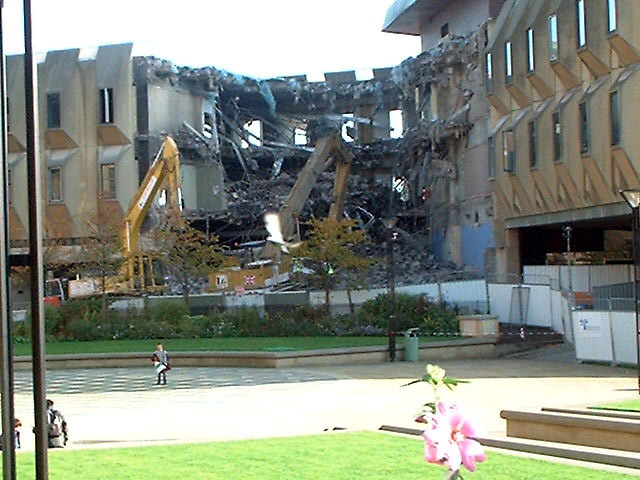 A clock tower was added the materials of which came from the parts of the building which had been demolished. 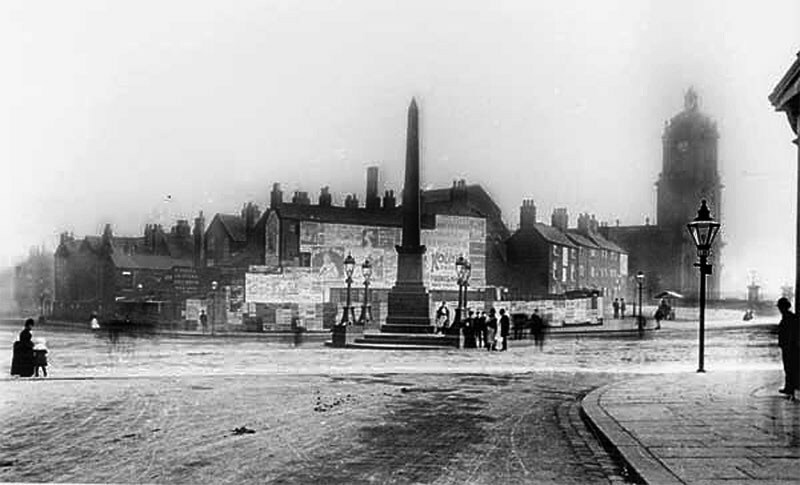 A drinking fountain had been built into the wall in 1857 facing Castle Street (the first of its kind in Sheffield). An underground tunnel or passage was built which connected the town hall to the newly constructed police offices in Castle Green. Although re-routed slightly here and there, this passage was still in use up to a few years ago and may well still be today. The present town hall was built in 1897 after a number of premises were cleared at the Surrey Street, Norfolk Row and Pinstone Street area. The tower is 193 ft high. Set on top of the tower is the figure of Vulcan raising aloft his newly forged arrows as a symbol of the staple trades. The new part of the building was opened on May 29th 1923 which was designed by F.E.P. Edwards using the same materials as those used on the original 1897 building. 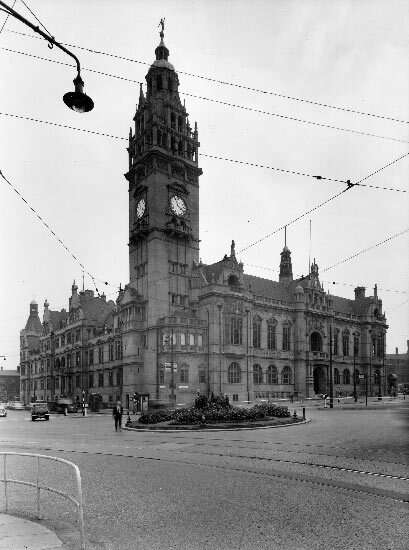 I have been trying to find records of the people who were responsible for the repairs of the Town Hall Clock, my wife's great aunt says her brother in law, my wife's granddad was responsible for repair and service of the clocks, probably some time between 1948 and early 1960s. but so far struggling to find anything. The name was Charles F Whiting he was a watch and clock repairer with premises at Hunters Bar and Attercliffe.